Mosque template and instructions below. Ramadan projects have kept my family active this year. My 12 year old brother is especially creative, who likes to play tennis and update his personal Ramadan Journal. He's constantly drawing or building models and making animations (he has his own YouTube channel!) Ma-sha-Allah. During one fast last week, he felt a little down so I advised him to pull out a crafting project from his Ramadan activity pack. "Boredom" is a no-no word in my family because we believe there is no such thing and that boredom is self-inflicted. When there is so much to see and do in Allah's world, we cannot possibly be bored. I compiled a collection of prayers, Arabic copy sheets and arty things for my brother's Ramadan activity pack and my two sisters. In his pack were two mosque models. One is a Ramadan lantern I designed which we've used with tea-lights. The other is a mosque model that is more architecturally pleasing (pictured). 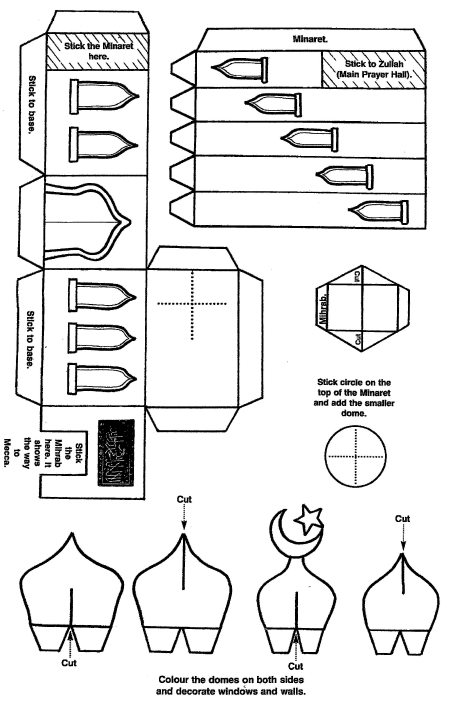 This is the 3D mosque model template with instructions which has been scaled to view. Published by The Treasure Box. Download this mosque model as an A4 pdf. file (21x30cm). This template makes a model about 14cm tall. Photocopy an enlargement to A3 or make several of these models for a community landscape. The back view of the mosque model is completed with a mihrab and minaret. Download the 3D Mosque Model template and get crafting this Ramadan.